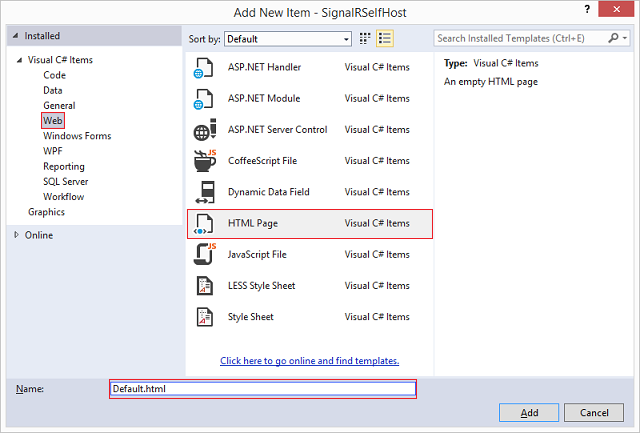 A SignalR server is usually hosted in an ASP.NET application in IIS, but it can also be self-hosted (such as in a console application or Windows service) using the self-host library. This library, like all of SignalR 2, is built on OWIN (Open Web Interface for .NET). OWIN defines an abstraction between .NET web servers and web applications. OWIN decouples the web application from the server, which makes OWIN ideal for self-hosting a web application in your own process, outside of IIS. Environments where IIS is not available or desirable, such as an existing server farm without IIS. The performance overhead of IIS needs to be avoided. SignalR functionality is to be added to an existing application that runs in a Windows Service, Azure worker role, or other process. If a solution is being developed as self-host for performance reasons, it's recommended to also test the application hosted in IIS to determine the performance benefit. In this tutorial, you'll create a server that's hosted in a console application, but the server can be hosted in any sort of process, such as a Windows service or Azure worker role. 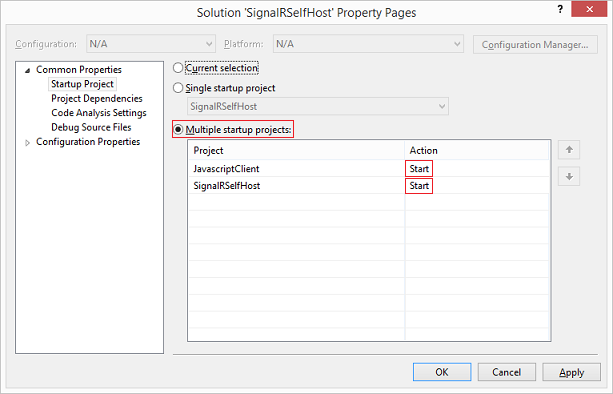 For sample code for hosting a SignalR server in a Windows Service, see Self-Hosting SignalR in a Windows Service. 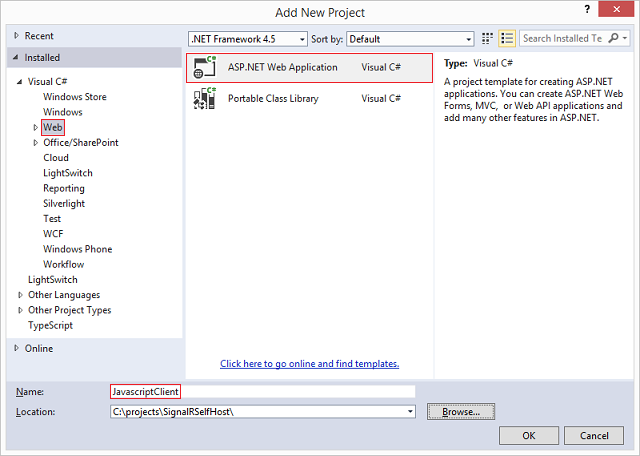 Open Visual Studio 2013 with administrator privileges. Select File, New Project. 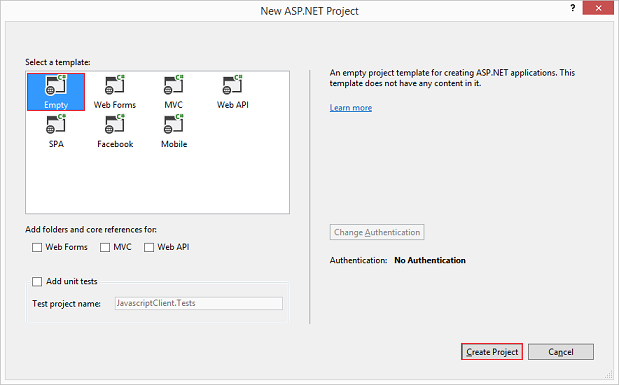 Select Windows under the Visual C# node in the Templates pane, and select the Console Application template. Name the new project "SignalRSelfHost" and click OK.
Open the NuGet package manager console by selecting Tools > NuGet Package Manager > Package Manager Console. 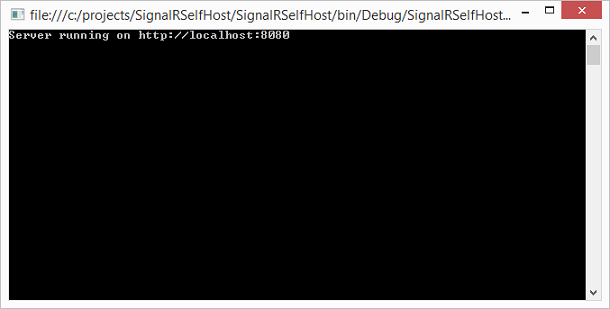 This command adds the SignalR 2 Self-Host libraries to the project. This command adds the Microsoft.Owin.Cors library to the project. This library will be used for cross-domain support, which is required for applications that host SignalR and a web page client in different domains. Since you'll be hosting the SignalR server and the web client on different ports, this means that cross-domain must be enabled for communication between these components. Program, including the Main method defining the primary path of execution. In this method, a web application of type Startup is started at the specified URL (http://localhost:8080). If security is required on the endpoint, SSL can be implemented. See How to: Configure a Port with an SSL Certificate for more information. 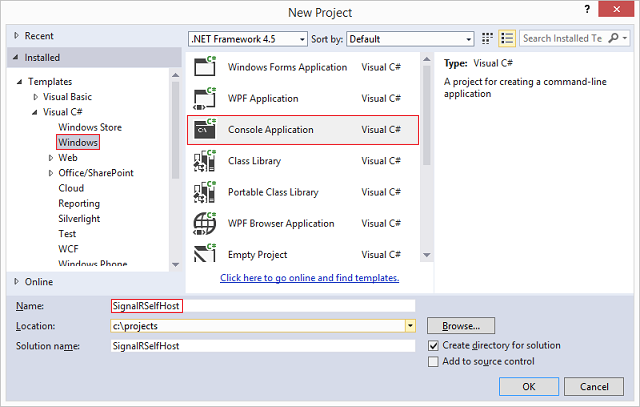 Startup, the class containing the configuration for the SignalR server (the only configuration this tutorial uses is the call to UseCors), and the call to MapSignalR, which creates routes for any Hub objects in the project. MyHub, the SignalR Hub class that the application will provide to clients. This class has a single method, Send, that clients will call to broadcast a message to all other connected clients. Compile and run the application. The address that the server is running should show in a console window. If execution fails with the exception System.Reflection.TargetInvocationException was unhandled, you will need to restart Visual Studio with administrator privileges. Stop the application before proceeding to the next section. Select the Empty template, and leave the remaining options unselected. Select Create Project. This command installs the SignalR and JQuery libraries that you'll need in the client. Right-click on your project and select Add, New Item. Select the Web node, and select HTML Page. Name the page Default.html. Replace the contents of the new HTML page with the following code. Verify that the script references here match the scripts in the Scripts folder of the project. The following code (highlighted in the code sample above) is the addition that you've made to the client used in the Getting Stared tutorial (in addition to upgrading the code to SignalR version 2 beta). This line of code explicitly sets the base connection URL for SignalR on the server. Right-click on the solution, and select Set Startup Projects.... Select the Multiple startup projects radio button, and set both projects' Action to Start. Right-click on "Default.html" and select Set As Start Page. Run the application. The server and page will launch. You may need to reload the web page (or select Continue in the debugger) if the page loads before the server is started. In the browser, provide a username when prompted. Copy the page's URL into another browser tab or window and provide a different username. You will be able to send messages from one browser pane to the other, as in the Getting Started tutorial.